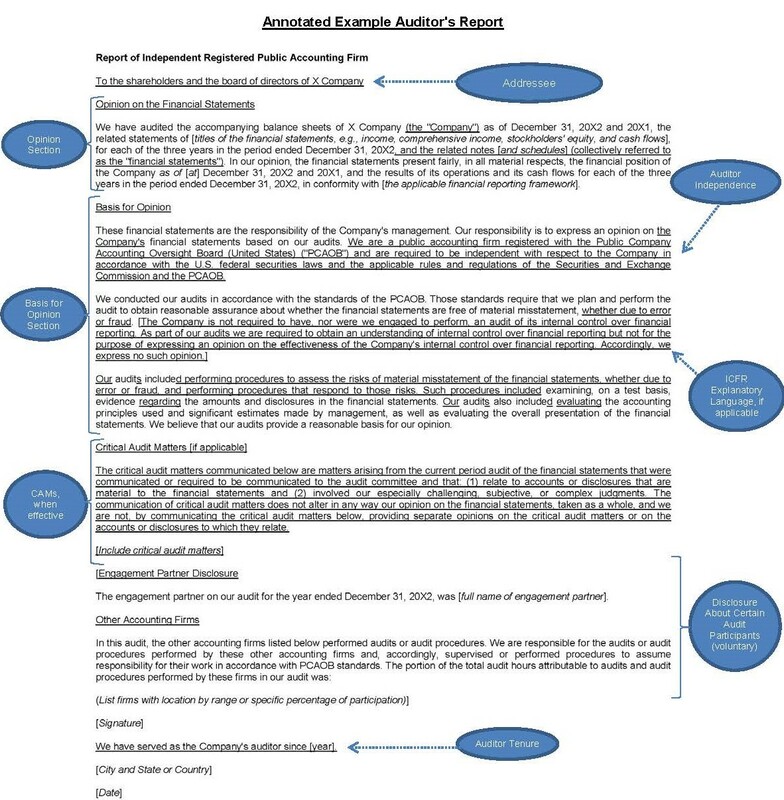 Further standardizing the reporting model by specifying placement and providing examples of disclosures and providing guidance in situations where auditors decide to include voluntary disclosures of information currently required to be disclosed in Form AP, Auditor Reporting of Certain Audit Participants. If there is uncertainty of the tenure of the audit firm, the auditor should state as much in its report and provide the earliest year which the auditor has knowledge it served as auditor. An illustration of that language is also provided. The update also states that it is not acceptable for an audit firm to make a statement or imply that the auditor did not determine its tenure. The update also addresses scenarios when an auditor's report is reissued by a predecessor auditor and states that the predecessor auditor may expand the tenure statement to indicate when its tenure ended. Examples of various specific scenarios are also provided to aid an auditor in determining the date of tenure. Registered investment companies are not required to have auditors opine on their assessment of the company’s internal control over financial reporting, but the auditor does issue a separate report on any internal control findings as a result of its audit of the financial statements. These findings are disclosed in the auditor’s report on the financial statements. This update specifies the location for the reference to the auditor’s report on the internal control and also notes that the auditor’s tenure is not required to be disclosed in the separate internal control report. The update recognizes that there are certain explanatory paragraphs such as going concern considerations, material changes in accounting principles and corrections of material misstatements that are required to be presented with an appropriate title immediately following the opinion paragraph. However, to the extent that an explanatory or emphasis paragraph is needed pertaining to other considerations, there is no guidance on placement, and the auditor should use its judgement in placement and appropriately title the section. An annotated example auditor's report from the PCAOB's Staff Guidance on Changes to the Auditor's Report, updated on August 23, 2018, appears below. The full Staff Guidance document from the PCAOB can be found here.